Sensors are a huge part of industrial applications. IHS estimates that over 100 million discrete sensors were shipped into industrial automation sectors in 2013. These vary greatly in size, use, and capability. Not all sensors are small and simple: some offer extensive functionality and the ability to connect to wider industrial automation networks. These more capable embedded computer sensors are becoming critical for the collection of data from industrial environments. They are helping move towards the next stage of industrial automation, whether this is called advanced manufacturing, “Industry 4.0,” or something else. As a brief overview, IHS views the term “Industry 4.0” as the combination of many factors and trends, including industrial networking, distributed embedded computer, cybersecurity, Big Data, and analytics, among other things, and combining these all to create a smart factory. Sensors offer great potential to gather extensive data from production lines and plants, which can increasingly be distributed via a network, analyzed, and then used to make better informed decisions. Benefits can include safety improvements, increased uptime, lower energy costs, and quicker or easier maintenance. There are potentials security concerns, however. Of course, for this to be implemented it requires a sensor capable of transmitting data over a network. Networkable sensors still make up only a smaller portion of the market, with a large number using basic signals to transmit information to a Programmable Logic Controller (PLC). Those sensors that are able to transmit data directly over a network generally also have some level of intelligence too, which can take loads off the embedded computer or other controller. These sensors communicate with a wide array of networking technologies, be they Ethernet- or fieldbus-based. It shows the estimated split between the two technologies. AS-i and IO-Link, two technologies that are more orientated towards sensors, are also highlighted (IHS defines these as fieldbus technologies). It is clear that the vast majority of networkable sensors utilize fieldbus-based networks, often HART or PROFIBUS. An estimated one-fifth of devices use AS-i, and although it is not seen by some as a true networking technology, AS-i is widely used and has been adopted by most major sensor manufacturers. IO-Link has the potential to be the main competition for AS-i in the future. However, there’s currently a lack of support from sensor vendors and the fact that AS-i has a safety variant may negatively impact on IO-Link adoption. In response, the IO-Link Safety group was recently founded, with a key aim of establishing a safety variant of the technology. Once this is available and proven, it should further bolster the excellent adoption rate that IO-Link is currently experiencing. The remaining 12 percent share of networking technology adoption for sensors is split amongst a number of Ethernet variants. There are as many Ethernet variants as fieldbus, but they are considerably younger to market and as such are not yet as widely adopted. 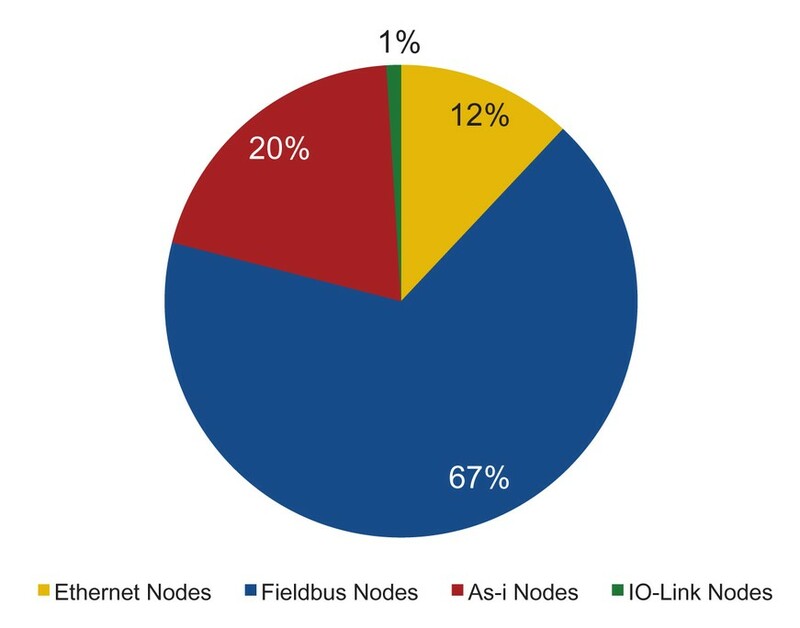 Fieldbus technologies are certainly not going to disappear overnight, but Ethernet adoption for sensor networking is growing more quickly. A variety of factors are driving this, but the most important is easy integration and interoperability with other industrial automation equipment that is already widely networked via Ethernet, be it in standard TCP/IP form or another embedded computer deterministic variant. The popularity and growth of Ethernet adoption has filtered down from consumer/enterprise networking. It was first used at the industrial information level, then the controller level, and is now slowly being seen at the field level. The transition from fieldbus to Ethernet is going to take time, as factories and large plants are rarely refitted. This means that a large portion of embedded computer will continue to be fieldbus-based, or perhaps an Ethernet/fieldbus hybrid for some time. So while the door has been opened for advanced sensor networks, we are still a long way from moving towards ”Industry 4.0” and the benefits that a networked sensor array can bring.